Mostly cloudy, with a high near 53. North northwest wind around 10 mph. Areas of frost after 5am. Otherwise, mostly clear, with a low around 36. North northwest wind around 5 mph becoming light and variable in the evening. Areas of frost before 8am. 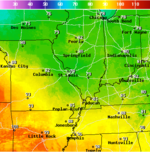 Otherwise, sunny, with a high near 71. Calm wind becoming southwest around 5 mph in the afternoon. Mostly sunny, with a high near 77. Light south southeast wind becoming south 5 to 10 mph in the morning. Mostly clear, with a low around 56. South wind 6 to 8 mph. A 20 percent chance of showers and thunderstorms after 1pm. Mostly sunny, with a high near 79. Southwest wind 8 to 13 mph, with gusts as high as 20 mph. A chance of showers and thunderstorms, mainly before 1am. Mostly cloudy, with a low around 57. Southwest wind 7 to 9 mph. A slight chance of showers, then a chance of showers and thunderstorms after 1pm. Mostly cloudy, with a high near 73. West wind around 8 mph. A slight chance of showers. Mostly cloudy, with a low around 56. West northwest wind 5 to 7 mph becoming light and variable after midnight. A chance of showers. Mostly cloudy, with a high near 73. East wind around 6 mph becoming west southwest in the afternoon. A slight chance of showers. Mostly cloudy, with a low around 55. West wind 3 to 6 mph. Mostly sunny, with a high near 73. North wind 5 to 9 mph.